Based just outside Chicago, IL, this call center company has both virtual and in-office call center agents. Windy City provides call center outsourcing to clients in need of both inbound and outbound calls. It hires its call center agents as employees (not contractors) and offers benefits like a paid time off, health care plan and 401K. The call center work at Windy City is telemarketing, but it is not cold calling or high-pressure sales. Reps may be full or part-time, but a commitment to a regular schedule of at least 20 hours per week is required. 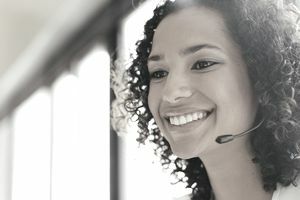 Agents make outbound calls and receive inbound ones from people who have filled out an online form to obtain information about colleges and universities. Agents match potential students with schools based on their interests. ﻿Phone reps set up in-person appointments with representatives of a home improvement company. Applicants should experience in sales, outbound calling and/or appointment setting and be skilled at overcoming objections. Hourly wage starts at $9 and increases to $10 after 90 days on the job. Incentives and bonuses are offered as well. Both full- and part-time employees begin earning paid time off after 90 days of employment. Training, which is done online, is paid. Blue Cross Blue Shield health insurance benefits available with the company contributing to the plan. Also, the company offers a match in the 401(k) plan. Applicants must live in the state in which the job is based. Some sales experience is preferred, but good listening skills, a professional telephone manner and the ability to work in a fast-paced environment are required. A landline phone is not needed, but a wired Internet connection is. Internet service must be of a certain speed which can be checked during the application process. The application process is online and includes a 15-20 minute online skills assessment. To apply go to Windy City Call Center website. Which Work-at-Home Call Centers Hire in Virginia?